Sealaska Heritage Institute (SHI) and the Klawock City School District have signed a memorandum of agreement to help develop the district’s existing elective Northwest Coast (NWC) art courses for high school students into a career pathways course over a three-year period. The program, Sharing Our Box of Treasures, is part of SHI’s effort to galvanize the region’s economy, perpetuate NWC art and to designate it as a national treasure. 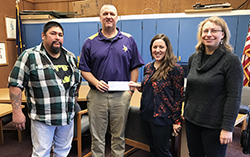 The effort is funded through a three-year grant from the U.S. Department of Education, Alaska Native Education Program, and as part of the program, similar agreements have been signed with the University of Alaska Southeast (UAS), the Juneau School District and the Hoonah School District. Through the program, partners will develop a two-year associate’s degree program in NWC art at UAS and award scholarships to applicants; expand the Juneau Fine Arts Career Pathway program to include a focus on NWC art and field-test courses in four high schools in partner communities; increase current retention rates and academic performance in math of Alaska Native high school students by integrating NWC art into math courses; document development and implementation of NWC art and culture programs at UAS and Sealaska Heritage; and produce a sustainability plan for the next phase of expansion. SHI’s art staff recently traveled to Klawock to meet with core project team members Superintendent Jim Holien, Native arts teacher Jon Rowan and administrator Eva Rowan. SHI staff learned about current and past efforts by Rowan and the school district to teach NWC arts to Klawock’s youth and discussed how to build on these efforts as part of the partnership and grant program. SHI staff also presented Rowan and Holien with a check to help fund staffing, supplies, tools and instruction needed to support the project.